Drawcom transmit and receive reject filters are designed for use in satellite earth station equipment. The Tx reject filters are designed to be used on receive systems to reject any spurious signals in the transmit frequency, while the Rx reject filters are used on transmit systems to reject any spurious signals in the receive frequency. Coupling value is 25 dB min. and 60 dB max. Coupling accuracy and flatness depend on frequency and bandwidth, typical values are ± 0.5 dB over 500 MHz. Minimum directivity is 20 dB. Return loss in main arm typically exceeds 26 dB. Return loss in secondary arm typically exceeds 19 dB (coupling-dependent). Drawcom’s Waveguide Circulators and Isolators are specifically designed to meet the requirements of high capacity and high performance microwave systems. The product line covers the frequency range from 2.7 GHz to 40 GHz. Drawcom supplies a full range of both high and low power waveguide pressure windows. 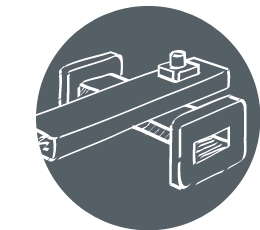 Drawcom’s waveguide to coax transitions are a means of adapting from coaxial to waveguide transmission line or vice versa. All models operate over the full waveguide frequency range. Improved VSWR performance is available over 10% of the waveguide band. Drawcom provides a complete range of waveguide terminations, from precision low power test bench items to high power forced air cooled devices. Flexible waveguide assemblies are available from WR28 to WR284 with North American or European Flange configurations. A comprehensive range of custom and catalogue rigid waveguide sections can be specified using the following data and model numbering. Of course assemblies made to customer drawings and special requirements are always welcome.